If there is one time of year that is harder on your budget than all the rest, it has to be summer. Okay, so maybe the holiday season would have something to say about that, but the point stands – summer can be rough on a family living on a budget. With the sun out and endless activities available to enjoy, it is tempting to blow through your budget in the name of a good time with family and friends. So, how do you stay on the right financial track while still enjoying life? We hope the follow tips help you during the coming summer. One of the best things about the summer is the great weather, and you shouldn’t have to spend a single penny to enjoy it. Look for parks and other local attractions which are free to enter and you can have plenty of fun under the sun. Even if you have trouble finding completely free attractions, parks passes and the like are typically quite affordable and can provide you with entertainment all summer long. 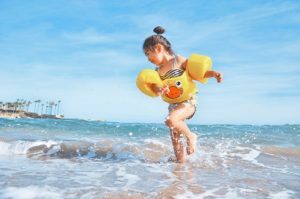 Taking vacations is a common activity in the summer months, and going away with your family certainly is a chance to make some great memories. However, traveling long distances can get expensive in a hurry. The transportation cost is usually one of the biggest expenses related to a vacation, so consider looking for destinations which are closer to home. Or, you can opt for a staycation. You can still have a great time, and you will be doing your budget a favor in the process. If you are going to be out and active during the summer, you can cut down on your expenses by packing your food in some instances. Heading out to the park or beach for the day? Take a picnic lunch rather than hitting up a local fast food spot. These might seem like simple things at the time, but the savings can add up in a big way over the course of a summer. If your work situation allows, try to enjoy some of your summer fun during the weekdays rather than on the weekends. Nearly everything is more affordable during the week, and things will be less crowded as well. It might not always be possible to avoid weekend activity, but do your best to pick out non-peak times as a money saving tactic. Don’t lose track of your standard monthly budget when the summer rolls around. Yes, you will probably be out having more fun than you do in the winter, but that doesn’t mean you can afford to throw your budget limitations out the window. Do your best to plan some summer activities within the construct of your standard budget. You will be rewarded for this discipline when September rolls around and your bank account remains in good condition. How do you have fun and save money in the summer? Do you have trouble sticking to your budget in the summer? These are great tips John. One thing we struggle with in the summer is that it can get SO hot that outside activities can be miserable. Maybe I’m just getting overly sensitive in my older age. 🙂 To get around this issue we try to get out REALLY early, and then again in the evenings if we can.